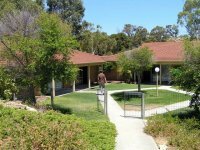 The Perth Bible College facilities include a number self contained units. These units are either one, two or three bedroom units and can be supplied with or without furnishings. PBC has the ability to accommodate single students (normally shared living arrangements, one student per bedroom), married students and families depending on the availability of units. Please contact PBC for information on current unit availability. Full-time Students: First consideration will be given to students who are enrolled in full-time studies at PBC. Part-time Students: If any vacant units remain available, part-time students would then be considered. All Others: If any vacant units remain available after all full-time and part-time students have been accommodated, other applications may be considered. This priority is applied to all vacant units available at the beginning of each semester of study. If you would like to rent a unit at PBC, please complete an Accommodation Application Form and contact the college. Vacant units are available for hire by families during the summer vacation period (approximately December – February) and when there are casual vacancies. Contact PBC for unit availability and application form. PBC is able to provide basic furnishing for units if desired. Furnishings include: a washing machine, refrigerator, cooking facilities & implements, basic kitchen items (crockery and cutlery), beds, lounge chairs, built-in wardrobes and study desk. Residents do need to provide their own bedding and personal items. 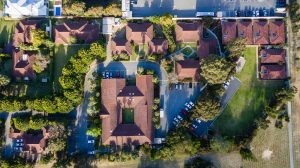 The rates for accommodation are based on the tenant’s level of enrollment. An application fee of $200 is to be sent with your Accommodation Application Form. A booking fee of $100 will be charged for late cancellations. Extended stays must pay 2 weeks in advance plus a bond of 2 weeks’ rent. Stays under 2 weeks must pay in full on reservation. Missionaries receive the same rate as a full time student, with a minimum charge of $200. The accommodation units are available for rental during the summer vacation period (December and February) and when we have casual vacancies.